– The report downplays the view relentlessly promoted by Israel that Hezbollah is merely a proxy for Iran, instead claiming that the Lebanese resistance group’s “activities increasingly reflect the movement’s needs and aspirations in Lebanon.” Tellingly, Foreign Policy magazine also published an interview this week with Israeli Ambassador to Washington Michael Oren, in which he warns that Iran may use Hezbollah and Hamas to start a new Middle East war. In a twist I couldn’t possibly make up, an hour before reading Perry’s article, I was meeting with the very same Ambassador Guy, a universally-respected senior diplomat who speaks fluent Arabic and knows her terrain well. In a conversation about the peace process deadlock, I asked about her views on engaging Hamas, which is currently excluded from the talks. Irony of ironies. The US military is the architect of cutting-edge diplomatic initiatives, and the civilian-run federal government advocates the flexing of military might to address conflict. 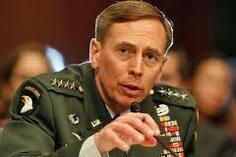 There is no reason to suspect that General Petraeus himself does not buy into the Red Team’s conclusions on Hezbollah and Hamas. In March, the CENTCOM commander testified: “the enduring hostilities between Israel and some of its neighbors present distinct challenges to our ability to advance our interests in the AOR [Area of Responsibility of Centcom]. The conflict foments anti-American sentiment, due to a perception of U.S. favoritism for Israel,” which in turn “limits the strength and depth of U.S. partnerships” in the region. Ironically, Israel and the occupied Palestinian territories are the one area in the entire Middle East that is not under CENTCOM’s 20-nation jurisdiction. Yet this is the theater which most seems to affect their ability to perform their duties elsewhere in the region. Changing the US position on Hezbollah and Hamas — resistance groups that have participated as political parties in fair elections and are favored by sizeable populations internally and throughout the Arab world — will almost certainly alter regional perceptions about the US’s willingness to engage realistically in brokering peace. People in the region are waiting for a change in action, not words, of US policymakers. Here is the Palestinian issue, here are the refugees and their right to return, here is the Jerusalem issue. They can show us some actions here first. The region wants to see tangible change and concrete actions first. The timing of the disclosure of the Red Group report is intriguing. The U.S. Senate unanimously confirmed General Petraeus as the new commander of US and NATO forces in Afghanistan on the same day as the Foreign Policy story dropped online. His popularity and prestige are at a peak. And importantly, Petraeus demonstrated some serious invincibility in Washington when he emerged unscathed after linking Arab-Israeli peace failure to CENTCOM’s difficulties in the Iraq-Afghanistan military theater. It is surely unlikely that this report, and the accompanying plugs by military intelligence officials, were leaked without the knowledge of some administration officials. Not this soon after the very public dismissal of Petraeus’ predecessor General Stanley McChrystal for criticizing, with his aides, senior administration officials in a Rolling Stone article. I believe this “new” thinking on Hezbollah and Hamas has been percolating for some time within this very administration. I reference an article I wrote last November pointing to evolving views on Hezbollah within the White House and State Department. The view on Hamas has been tackled even more proactively — even before Obama became president, he was being urged to take a more pragmatic approach to the Palestinian resistance group by a broad array of former senior US officials, Republicans and Democrats alike. Interestingly, the leak comes just days before Israeli Prime Minister Benjamin Netanyahu — an unwavering foe of Hezbollah and Hamas — is due in Washington for talks with President Obama. Netanyahu isn’t much liked by this administration, and CENTCOM’s last leak opened up an unprecedented debate on whether Israel was a strategic liability for the United States. Post-flotilla, these are the same conclusions arrived at by many Western governments, whose first order of business was to diffuse tensions by pushing Israel to “ease” its siege. The Red Team has passed an important credibility test at this first hurdle. With nothing but a failed peace process to stare at, this US administration would be wise to embrace the report’s daring recommendations and welcome Hezbollah and Hamas as full participants in any Mideast solution. Note: Readers can access my interview with Hezbollah and Hamas foreign relations chiefs here.